It is generally agreed that interest in incorporating Seabrook Island as a town grew out of a fear of annexation by the City of Charleston. However, added to this fear was an apprehension by many residents that the residential character of the island was also at risk. This arose because the island’s previous developer had successfully sought rezoning from the Charleston County Council for 46 condominiums near the beach club area. In the mid-1980's, there was a growing interest among leadership at the Seabrook Island Property Owners Association (SIPOA) that residents could better control planning and zoning and take over other functions of municipal government if the community were incorporated as a town. An incorporation committee was established by SIPOA to study the feasibility of incorporation. The committee was initially chaired by Jack Garvin, a retired Air Force colonel. Joel Thompson, who would later be elected as the town's first mayor, would later chair the committee. Other individuals who were involved in the incorporation effort were Tish Dixon, Lou Favret, Tom Ford, Keith Fuller, Gerry Gordon, Julius Green, Joe Hall, Bob Johnson, Curt Judge, Paul MacMillan, Don Moore, Dan Simon, Phil Pressler, Jack Reigart, Marilou Stonehouse, Peggie Theoharous and Wilson White. 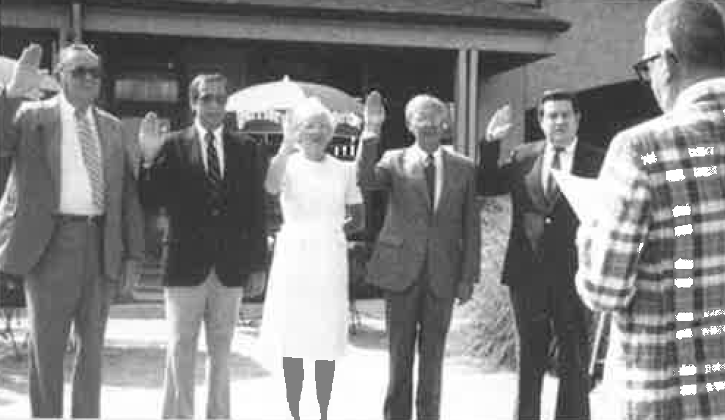 In August of 1986, the committee recommended incorporation of the Town of Seabrook Island. The committee sought to include about 3,550 acres composed of the Seabrook Island resort, the road to Seabrook Island, Bohicket Marina, Camp St. Christopher and some undeveloped property. Consideration was given to including Kiawah Island within the town’s boundaries, but the idea was rejected because Kiawah was approximately three times larger than Seabrook, and committee members felt that the inclusion of Kiawah could dilute Seabrook’s control. SIPOA endorsed the recommendation; however, to avoid criticism that SIPOA was sponsoring an effort not supported by the entire community, it was determined that the incorporation effort should be implemented through a privately financed, independent committee. ​A town hall meeting of residents was called in mid-September 1986 to discuss the pros and cons of forming a town. At the time, it was estimated that between 500 and 600 people lived full-time on Seabrook Island. The law required signatures of 50 registered voters from the island and 15% of the island's property owners - whether full-time residents or not - to petition for incorporation. The Incorporation Committee obtained the requisite numbers and in October of 1986 filed a petition containing the proposed town boundaries, the form of government, election method and terms of elective office with the South Carolina Secretary of State. Two months after the incorporation petition was filed, the Secretary of State authorized the committee to hold an election as to whether the town should be incorporated. The election was originally scheduled for March 3, 1987 but had to be postponed when U.S. Justice Department authorization was not received in time. The Justice Department was required to determine that the referendum did not have a discriminatory intent before it could authorize the vote. ​Then-developer, Robert Russell, vigorously opposed the incorporation effort, stating that the fear of annexation by the City of Charleston was "a little exaggerated." He suggested that for the City of Charleston to annex Seabrook Island, it would first have to annex large portions of Johns Island, and even then, annexation could only occur if 75% or more of the voters approved the action. Russell noted that Mayor Joseph Riley had stated that Charleston had no intent to annex Seabrook Island. Mr. Russell also claimed that the needs of the community would be too sophisticated for the modest budget projected by proponents of the town, and he raised concerns that Seabrook Island would no longer be a gated community. In an attempt to stop the incorporation effort, Mr. Russell filed suit seeking a temporary injunction in February of 1987. Mr. Russell simultaneously asked the court to render a declaratory judgment as to the legality of incorporation, alleging that the required statutory procedure for incorporation had not been followed. Specifically, Mr. Russell alleged that the Incorporation Committee's petitions did not contain a sufficient number of signatures, and that some of the signatures were invalid. Advocates of incorporation alleged that the suit was a delay tactic to allow Mr. Russell more time to obtain Charleston County's approval for his development projects before incorporation of the town was finalized and control over zoning was transferred to the Island's residents. There were opponents of incorporation among the property owners as well. They argued that a town government would be in conflict with the property owners’ association, and because only registered voters would have a hand in choosing elected officials, non-resident property owners would be disenfranchised. Matters became further complicated when several of the island's residents who were opposed to incorporation obtained a temporary injunction delaying the vote until the court could decide if the town could continue to use the security gate to limit access. They contended that residents who had signed the petitions for incorporation didn't realize that the security gate might have to be removed. The court dissolved the temporary injunction in April of 1987. ​Approval from the U.S. Justice Department was ultimately received, and the question of whether or not to incorporate was put to vote on May 19, 1987. The vote was overwhelmingly in favor of incorporation, with 341 voting in favor of incorporation and 65 against. At the same time the voters approved the town's official name, a mayor-council form of government, two-year terms for elected officials and non-partisan candidates running in at-large elections. The results of the vote were filed with the office of the Secretary of State, which issued a certificate of incorporation on May 26, 1987. This created a "legal entity," but the town’s charter would not become effective until after the mayor and council were elected and sworn in. The court denied Mr. Russell's request for an injunction on August 13, 1987, holding that he had failed to prove that the election would cause irreconcilable harm. The town’s first municipal election was held shortly thereafter on August 18, 1987. 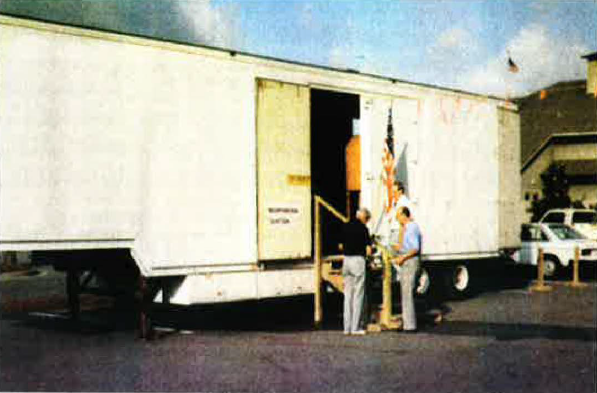 The town's only voting precinct was a moving van located at Bohicket Marina. There were ten candidates for mayor and council. Four hundred and forty-one votes were cast. Joel Thompson was elected the town's first mayor, defeating Warren Watts. The elected councilmen were Richard Rakovich, David Hughes, Thomas Semmens and Marilou Stonehouse. Other candidates for town council were Joseph Hall, Edward Pagola, Seth R. Davis and Kipp K. Valentine. The remaining elements of Russell's litigation were ultimately resolved in favor of the town in the spring of 1988. The initial priorities of the new Mayor and Town Council were to find a location for a new Town Hall, obtain funds to operate the town’s government and to enact ordinances under which the town would govern. While getting organized financially and administratively, the town also had to contend with legal matters arising from the incorporation lawsuit. Other early objectives included negotiating franchise agreements with cable, telephone and electric providers. Following a successful referendum in 1995, the town acquired the island's water and sewer system from Heater of Seabrook, Inc., a private utility owned by Minnesota Power and Water. The Seabrook Island Utility Commission (SIUC) was established by ordinance of Town Council for the purpose of managing operations and maintenance of the town's water and sewer system. The SIUC provides water and wastewater service to all residents and businesses within the town. The SIUC also provides wastewater treatment to certain areas outside the town limits, including Cassique, Freshfields Village and Kiawah River Estates. 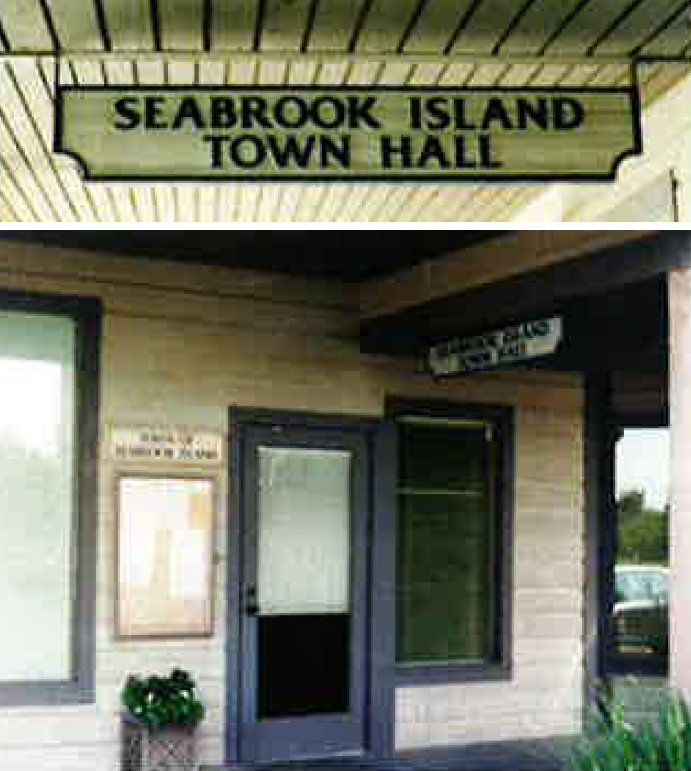 In 2001, the town's administrative offices moved from a storefront at Bohicket Marina into a newly constructed Town Hall building, located at 2001 Seabrook Island Road.